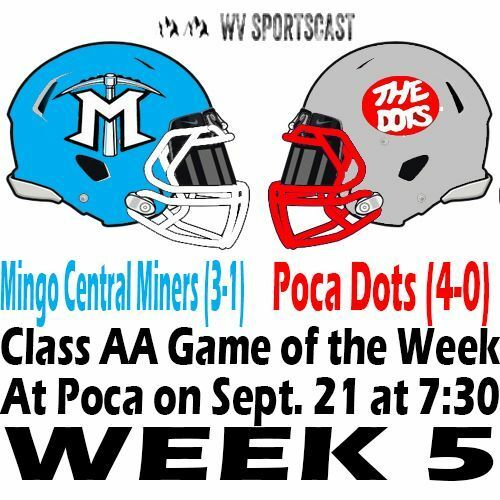 The Poca Dots come into this game with their undefeated streak on the line and all the hype behind their football program! However, it wasn't that long ago that The Dots were 2-28 in 3 seasons. The Dots are known for having a legendary football program though as they won 3 straight Class AA state championships from 2001-2003. 2003 was the last time that The Dots started out 4-0. The Dots have returned 8 starters on both sides of the ball. The Dots are led by sophomore quarterback Jay Cook and sophomore running back Ethan Payne. Senior wide receiver Bronson Skeens is also, a playmaker on both sides of the ball playing defensive back as well. The Dots will try to stop an overall talented Mingo Central team. Their only loss coming at the beginning of the season to Point Pleasant by a touchdown. The Big Blacks are still undefeated at 4-0, but The Miners very well could be too. The Miners are sitting at 3-1 on the season. The Miners are led by sophomore quarterback Daylin Goad who is doing pretty well replacing Marshall basketball player Jeremy Dillon who won The Kennedy Award as a junior in 2016 along with leading The Miners to a Class AA state championship. The Miners were expected to be rebuilding, but it seems like they are doing just fine as they just reloaded instead of having to rebuild. Doug Dillon is another weapon for The Miners in the rushing game having played at Phelps High School in Kentucky last year. The Miners have Drew and Devin Hatfield who are explosive in the receiving game and can really hurt teams. Drew was the first team all-state a season ago and is one of the best receivers in the state. Josh Kinder and Isa Scales are playmakers on defense for The Miners. Both teams need a win in this big game, but most importantly The Dots need it to prove their worth and for good playoff positioning. Will Poca's time run out Friday or will they prevail over The Miners in this big time game? Kick-off is set for 7:00 p.m. at Poca.